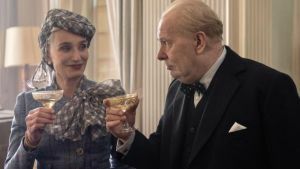 Starring: Gary Oldman, Kristin Scott Thomas, Lily James, Ben Mendelsohn, Stephen Dillane, Samuel West, Ronald Pickup, David Schofield. 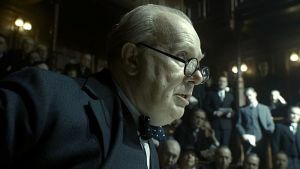 At the precipice of World War II, within days of becoming Prime Minister, Winston Churchill must face one of his most turbulent and defining trials: exploring a negotiated peace treaty with Nazi Germany, or standing firm to fight for the ideals, liberty and freedom of a nation. 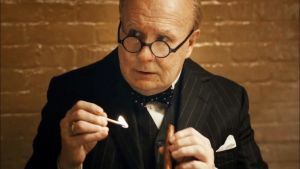 As the unstoppable Nazi forces roll across Western Europe and the threat of invasion is imminent, and with an unprepared public, a sceptical King, and his own party plotting against him, Churchill must withstand his darkest hour, rally a nation, and attempt to change the course of world history.